Learn more about Important changes to our 2019 membership program. 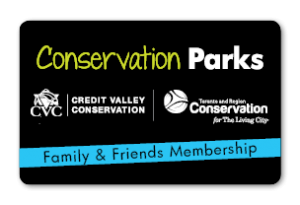 In addition, your Conservation Parks membership gives you access to discover trails and connect with nature at the following CVC properties: Elora Cataract Trailway, Limehouse Conservation Area, Meadowvale Conservation Area, Rattray Marsh Conservation Area, Silver Creek Conservation Area and Upper Credit Conservation Area. Contact Visitor Services at 1-800-367-0890 or recreation@cvc.ca to order a gift membership. We can provide you with a personalized digital or printed option.